The Western China Overseas Postdoctoral Innovation Demonstration Center of Xi'an Jiaotong University was formally stationed on Tuesday in the Western China Science and Technology Innovation Park in Xi’an, Shaanxi province in Northwest China. Zhang Maizeng (left), secretary of the Party Committee of Xi'an Jiaotong University, and Wang Xiaochu, former vice-minister of the Ministry of Human Resources and Social Security, attended the ceremony. 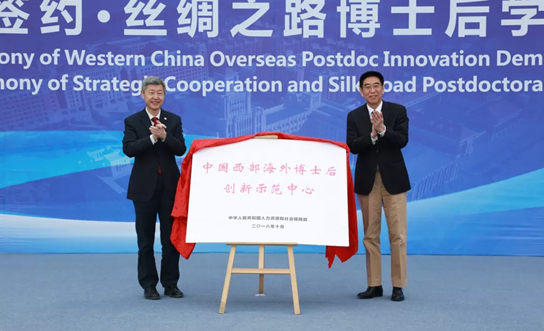 The center is the first national post-doctoral innovation platform built in West China with the approval of the Ministry of Human Resources and Social Security and the first national post-doctoral innovation demonstration center featuring post-doctoral international exchanges in universities. The center was approved in October 2018, and aims at innovating the system and mechanism of post-doctoral training, gathering high-end talents, providing strong scientific and technological support for economic and social development, and exploring a new mode of university reform and innovation in China. 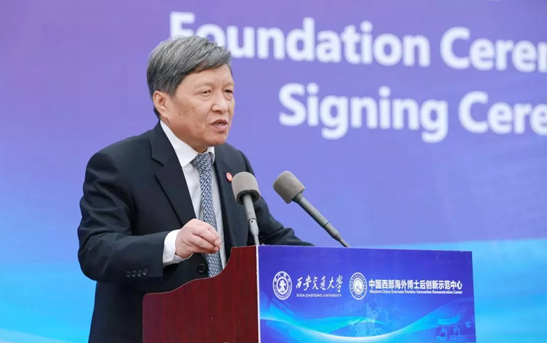 Wang Shuguo, President of Xi'an Jiaotong University, said that the Overseas Postdoctoral Innovation Demonstration Center in Western China is opened to the whole world. It is expected that talents from all walks of life will gather here to learn from and help each other on this sharing platform, so as to help human society develop better. "I strongly agree with President Wang Shuguo that the universities all over the world should extensively communicate and cooperate with each other under the framework of the Belt and Road to jointly solve the current thorny problems and work together for a better and more friendly world,” said Gay Jenning, professor and special envoy to the president of Washington University in St. Louis. After the opening ceremony, the Silk Road post-doctoral symposium was held, at which Xi'an Jiaotong University signed talent cooperation agreements with 48 government agencies, universities of the Silk University Alliance, enterprises and institutions, taking a new step in cooperation between government, schools and enterprises.